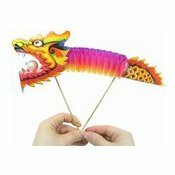 Description: This paper dragon puppet will provide hours of amusement and features a pearlescent ball in his mouth. The puppet is easy to control and the dragon's body may be extended and moved like a concertina. Simply enter your details below and we will send you an e-mail when “Paper Dragon Puppet (Large) (中國紙龍)” is back in stock!